Comite Resources has carried out a wide variety of environmental mapping, including ground-truthing, delineations, and analysis of spatial environmental data over time. Below are several examples of projects with an environmental mapping component. 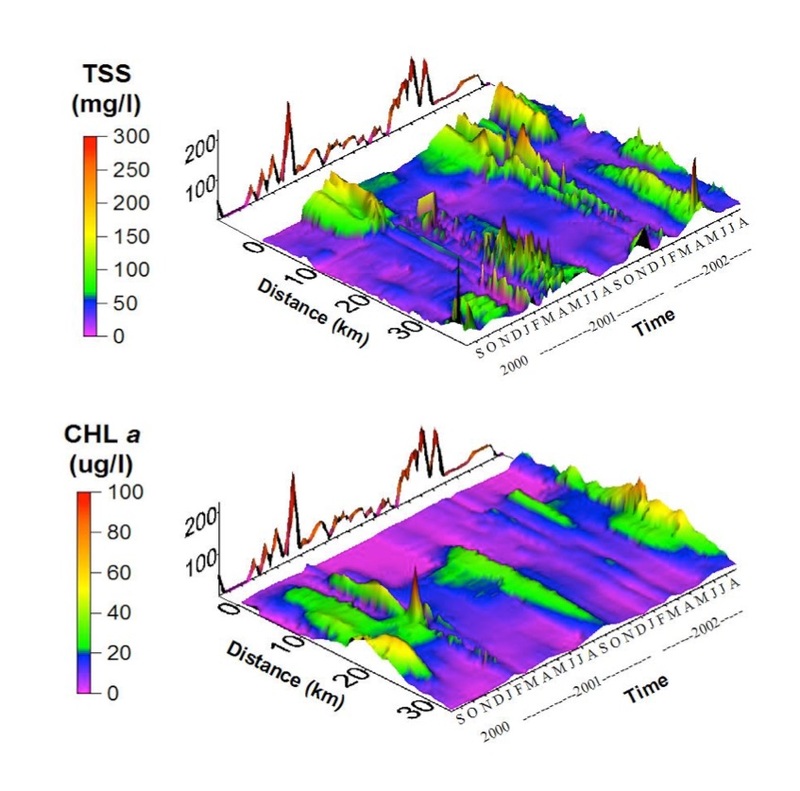 Spatial-temporal graphs of total suspended sediment (TSS) and chlorophyll a (CHL a) in the Breton Sound estuary. Time is shown on the x-axis and distance from the Caernarvon structure on the y-axis. Discharge from the Caernarvon diversion is indicated by the red line superimposed on the x-axis. The Caernarvon river diversion structure is located at the northern apex of the Breton Sound estuary in coastal Louisiana. To determine the impacts of the freshwater diversion on water quality, scientists with Comite Resources developed a flow-through system whereby water from under the boat was collected while traveling at full speed and delivered to a series of instruments that measured salinity, suspended sediments, chlorophyll, and temperature every 5 seconds, or approximately every 100 m (Lane et al. 2007). Revised coastal zone boundary established by Act 588 of the 2012 Regular Session of the Louisiana Legislature. The Coastal Zone Management Act of 1972 (CZMA) defined the coastal zone as the coastal waters and adjacent shore lands that extend inland only to the extent necessary to include areas that have a direct and significant impact on coastal waters and/or are likely to be affected by or vulnerable to sea-level rise. The first study to determine Louisiana’s current CZB was initiated in 1975 but it was later revised in 1989 to incorporate social, political and governmental considerations. The resulting CZB included all or parts of 19 parishes and approximately 5.3 million acres. 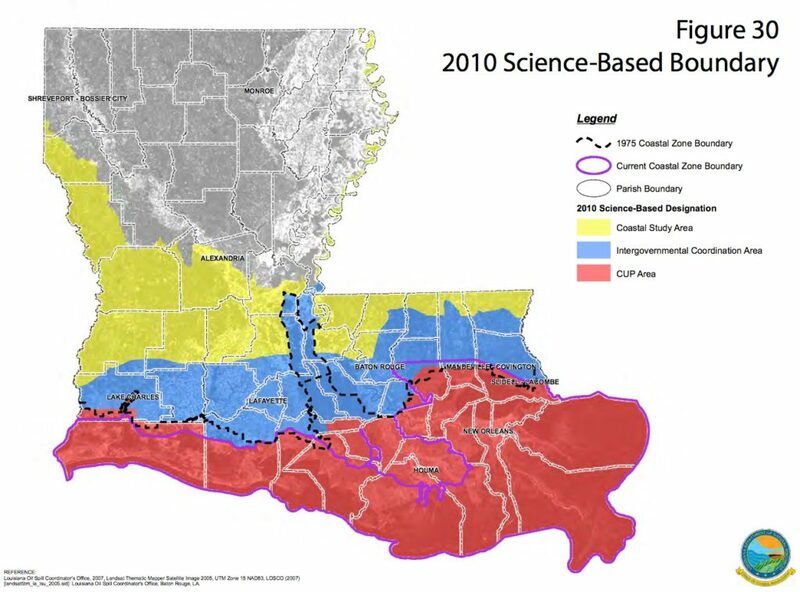 In 2009, Comite Resources scientists worked with scientists from Shaw Environmental and Infrastructure, Louisiana Department of Natural Resources, and Louisiana Sea Grant Law and Policy Program to evaluate and revise the 1989 coastal zone boundary to better allow the State to manage, protect, and restore its coastal resources.